the last geek bus home: Browncoats: Redemption, Dragon*Con, Knights of the Guild and writerly news - too much awesome! 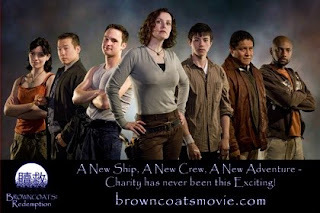 Browncoats: Redemption, Dragon*Con, Knights of the Guild and writerly news - too much awesome! Are you going to Dragon*Con? Michael Dougherty, co-creator of the new fanmade film set in the Serenity/Firefly universe gave me an interview for Whedonage which went up today. They have finished principle photography and are racing towards the deadline for the film to be ready Dragon*Con 2010, but on Sunday they will be unveiling the trailer. The photos and videos from the set look stunning and I wish I could be there to see it! Full details are at the end of the article and you can also follow them on Facebook for all the current news. Panelists Include: Sandeep Parikh (Creator / Co-Writer and Director, The Legend of Neil), Tony Janning (Star (Neil) and Co-Writer, The Legend of Neil)"
Why did it have to be the Unicorn Theatre? Haven't they suffered enough?!? If you don't know what I'm talking about then you need to head over to The Guild Forums and join the Axis of Unicorns and help the Unicorn Defense League protect these noble creatures from the jaws of unscrupulous Guildies! "Quest for the Music Video" shows how hard that Kenny and Jenni work to bring us all the news and behind-the-scenes information we crave about The Guild. In this latest installment there is a great interview with Greg Aronowitz who created the wonderful weapons the cast sport in the "Do you wanna date my Avatar" video AND the reveal what the filming at the video was like. Kenny and Jenni don't just host the podcast, Kenny is the official behind-the-scenes photographer who has shot all the amazing BTS video and pictures used on The Guild DVDs and Jenni has a myriad of jobs - from Felicia's PA to Head Production Assistant to gold coin counter - and everything in between. There are also lots of feedback comments from listeners (both written and audio), which is really great to hear. It's very rewarding when people take the time to leave a comment. And in all the excitement I had some pretty exciting news myself today. I've been podcasting "Turning Left at Albuquerque" for a few weeks now on turningleft.podbean.com. We're up to chapter 50 now, so if you haven't caught up yet please check it out. This week we posted a new promo instead of a new omnibus and we also had a request of listeners asking for some feedback. It doesn't take much to write a comment and you could hear it read out by Lord Poncenby! Or you could send an audio comment to turningleftpodcast at gmail dot com. And then, today, I had an email from an agent who is interested in my new super-secret project asking me for a partial submission. This is a big deal you guys! I only queried a few agents for this new (non-fiction) project and I am very excited that this agency wants to hear more because I think they will really 'get' it. It doesn't mean it's in the bag, and it might all come to nothing, but it a great first step. So YAY! Yes, please support the KOTG so Jenni doesn't have to take off her top. :) She said that that would be the obvious next step and she's a determined person!